Kelsey Bruce discusses student engagement at Linfield College with regard to hosting the annual Singletary Speech and Debate Tournament. 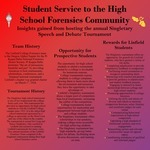 Bruce, Kelsey, "Student Service to the High School Forensics Community: Insights Gained from Hosting the Annual Singletary Speech and Debate Tournament" (2019). Student Engagement Posters. 3.